The AirPower is gone. But, that doesn't mean that there aren't Qi charging options for your iPhone or AirPods Wireless Charging Case. Here are some of the options that we like the most. 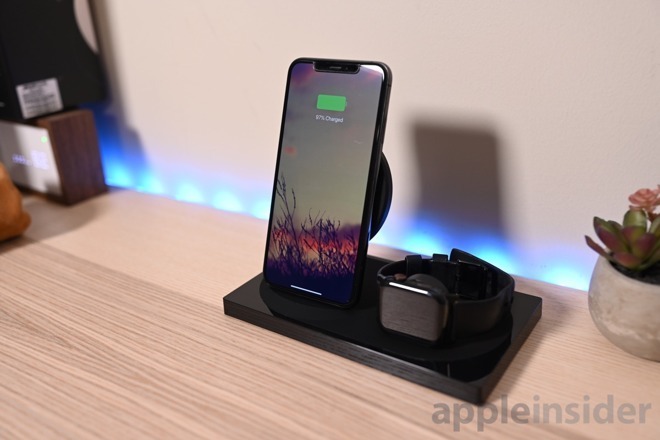 Introduced with the iPhone X in 2017, wireless charging is a great way to recharge an iPhone, without needing to connect a Lightning cable. Instead, the iPhone is placed on top of the charger, positioned in line with an embedded charging coil which transfers power to the iPhone's battery. 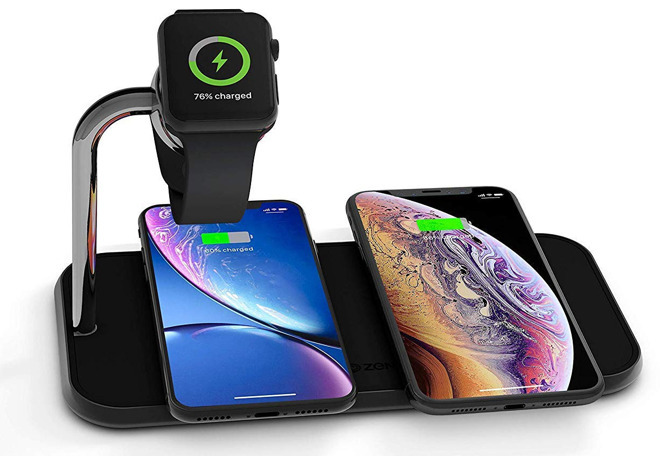 Generally speaking, wireless charging is not the fastest way to apply charge to your device, as current iPhone wireless charging is limited to 7.5 Watts in the iPhone X and iPhone 8, following an upgrade from the 5 Watt limit at launch. By contrast, a wired connection can take advantage of Apple's other wall chargers offering far higher power transfers. 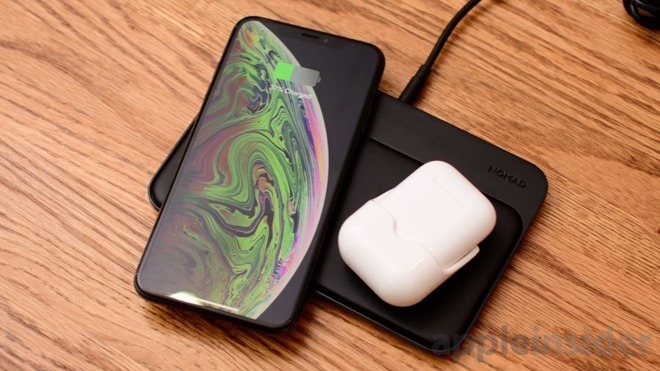 While wired charging is faster, wireless charging offers more convenience, in that all you have to do to start the charging progress is to place the iPhone down on a surface. This also makes using an iPhone as a clock far easier, as there's no fumbling to plug the cable in before falling asleep, nor to unplug it when waking up or needing to answer an important early morning call. Obviously, we'd have preferred the AirPower. Now that it's gone, we have suggestions. Looking for something to charge multiple devices? Consider the Nomad Base Station. This premium charger is made of leather and aluminum with both USB-A and USB-C outputs. It can charge two phones simultaneously at 7.5W. If you want more details, check out our full review. You can grab it now from Nomad for $99.95. Nomad also has a Base Station that will charge the Apple Watch too. The Nomad Base Station is an excellent charging solution. On top is a leather-covered charging pad with a trio of coils beneath. This allows two devices to be charged at once, or a single iPhone horizontally. The Apple Watch charging puck is fully integrated so you don't need to supply your own, works with any band, and supports Nightstand Mode. The body is made of metal which gives it a solid feel compared to the plastic alternatives. Nomad also makes available a Base Station without the Apple Watch charger and dual USB outputs instead, and an optional walnut finish. If you're lucky enough to have three Apple devices, the Zens Charging Pad and Watch Charger Station can handle them all simultaneously — though with 20-watt maximum output, it can only fast-charge two. That's still probably more than sufficient if you sit this in your office or bedroom. The Station is MFi-certified by Apple, and made of aluminum for better durability and aesthetics. Some other touches include anti-slip material, auto power-off, and wide coils that avoid fumbling around for precise placement. Amazon is selling the product for $99.99. Belkin has always made reliable Apple accessories and they've done so again with their BoostUp Charging Dock. It can handle both your iPhone and your Apple Watch with an additional USB-A output on the back. The body is mostly made of metal with a soft-touch silicone surface on top to rest your watch and phone. The USB-A port on the back can be used to power up and iPad, another iPhone, a battery pack, or your headphones. This too has the Apple Watch charging puck entirely integrated so no need to supply your own. You can grab it for $149 from Belkin in black or white. 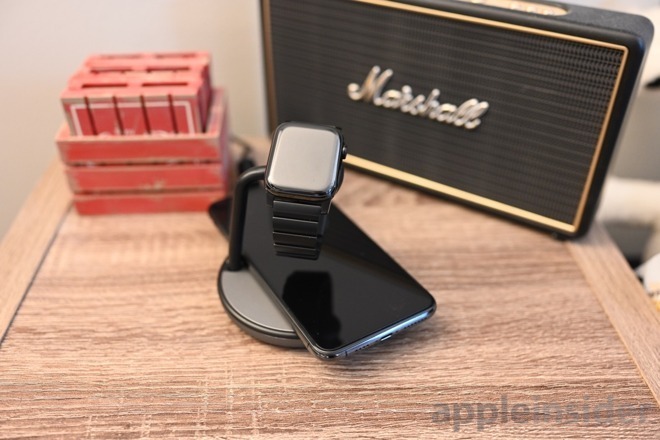 The Kanex GoPower Watch Stand with Wireless Charging Base is an Apple-certified Apple Watch charging puck positioned above a round wireless charging pad for your iPhone or other Qi-enabled devices. We've covered our fair share of multi-chargers thus far, but Kanex is the most compact we've seen yet. It has an overall small footprint with the ability to power up three devices simultaneously. A USB-A output on the back lets you charge devices of your choice, while the Qi charger can be used for a phone or a wireless set of AirPods. It is available just under $80 from Amazon. 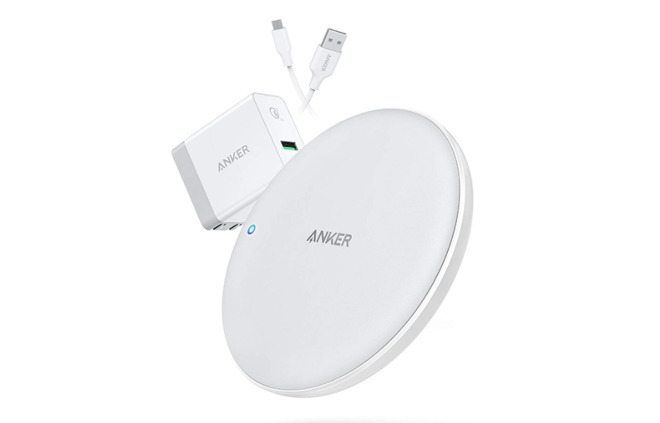 For those wanting a simple charging mat, the Anker PowerWave 7.5 Fast Wireless Charging Pad is a good option, providing up to 10W charging for some devices. Supplied with a Quick Charge 3.0 wall charger and a 6-foot Micro USB cable, it offers over-charge protection and foreign object detection, in case something is incorrectly placed on top of the mat. 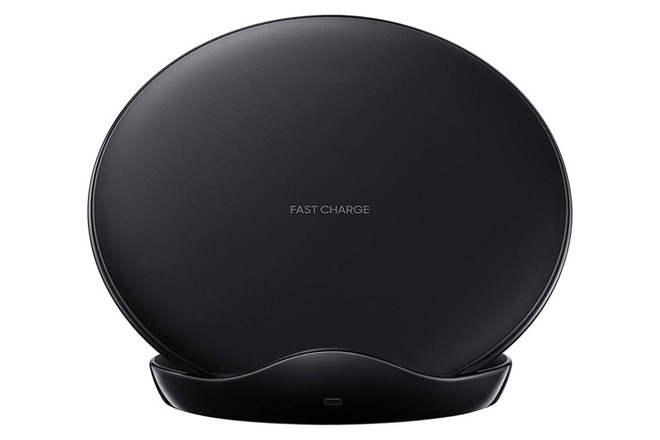 Amazon is selling the Anker PowerWave 7.5 Fast Wireless Charging Pad for $45.99. For more info on the charger, see our detailed review. RAVPower is another of our favorite brands, creating great batteries and chargers at affordable prices. We reviewed their new line of iPhone compatible chargers when they launched and have recommended them ever since. They've options to choose from including a charging stand and the common charging pad. Even a portable battery if that is more to your liking. They start off at $16.99 on Amazon, though our favorite HyperAir charging puck will run you $29.99. Want a cheap and simple charger? 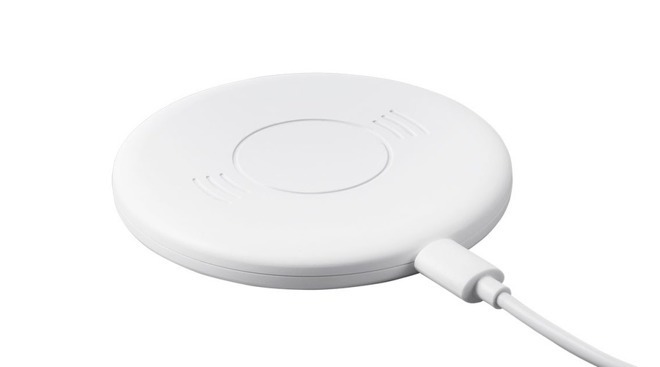 Monoprice's Wireless Charger is Qi compliant and has a clean appearance, resembling a thin white puck measuring 3.3 inches in diameter, 0.4 inches thick, and weighing in at 1.8 ounces. It only outputs power at 5V DC 1A, meaning it won't offer any fast charging capabilities, but it does include a blue "breathing" indicator light when it is charging a device, switching to a solid red when fully charged. Monoprice is currently pricing it at $7.99. The low cost makes it a viable option for adding wireless charging points in multiple locations around the home, or even to add one in the office. 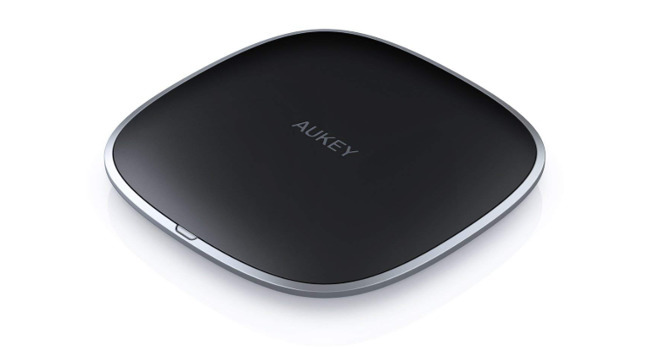 Winner of the Red Dot Design Award in 2018, the Aukey Graphite Wireless Charger offers a stylish matte black pad and a lighter trim, with the plate measuring 3.41 inches square and 0.46 inches thick. Able to work with Qi-compatible smartphones in cases, the charger includes a plethora of safety features, including temperature control, power input monitoring, foreign object detection, and overcharging. Supplied with a 3.3-foot USB 2.0 A to USB-C cable, the charger is available for $15.99. Grovemade has a history of using natural materials to make beautiful products. It is seen clearly in their wooden iPhone cases, as well as their Qi wireless chargers. The topmost surface is made of cork which gives your phone a gentle surface to rest on. Stainless steel makes up the bottom, giving the pad added heft. Nylon wraps the extra long USB cable for bonus durability. If the cable is too long, it can be wrapped up on the underside which is useful for keeping your desk tidy, or for taking with you for a weekend getaway. You can get a Grovemade pad in one of three colors starting at $79. Belkin has always put out top-notch products and all their BoostUp chargers exemplify this. There's a charging pad as well as a stand to give you options. The newer Bold line of pads and stands are a bit pricier at $59.99 and $69.99 respectively, but they are a bit more powerful and compact. Grab any of them direct from Belkin. 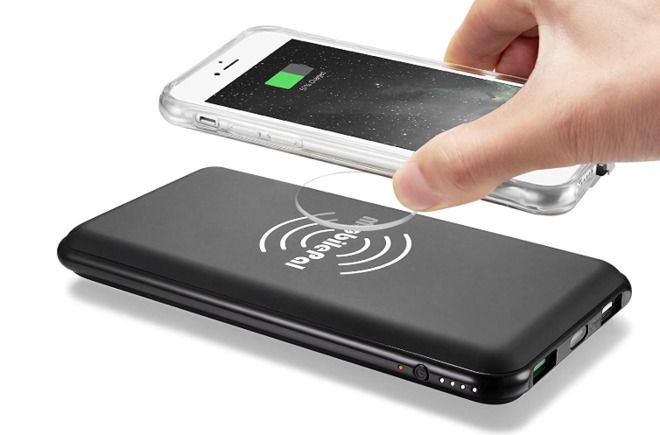 If you want wireless charging on the move, the MobilePal Gen-3 10,000mAh Qi Wireless Charging Power Bank is portable power that offers more than the usual power bank features. Like others on the market, it includes two USB ports for wired charging, including one with QuickCharge 3.0 support, while on one side is a Qi wireless charging spot that delivers at up to 5 Watts. This can even enable for up to three devices to be recharged simultaneously. Including a power button, microUSB input for charging, a battery indicator, and a flashlight function, this power bank is available for $39.99. 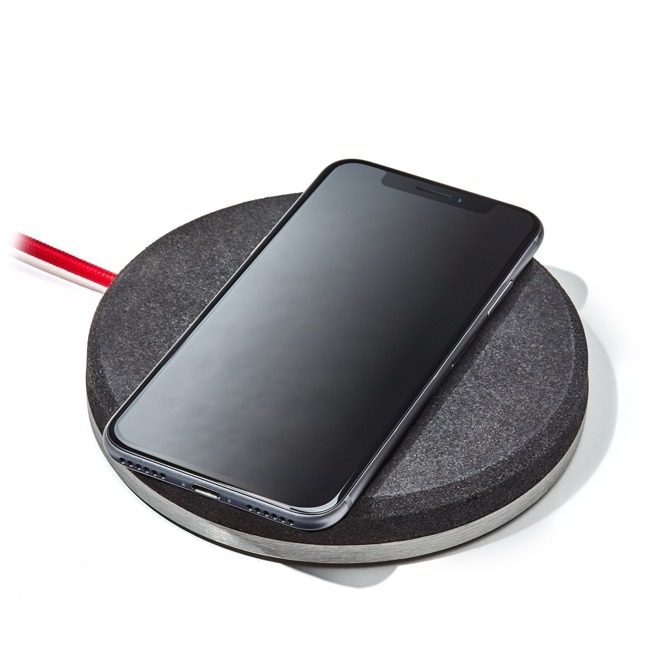 The RAVPower Qi Wireless Charging Pad stands the iPhone X upright on a non-slip rubberized base, with a single discrete LED informing users of the charging status. This unit uses two wireless charging coils, which allows for the iPhone to be oriented vertically or horizontally, allowing users to position it in relation to the apps they are using, while still charging the battery. Offering a maximum output of 10W for compatible Qi devices, the RAVPower Qi Wireless Charging Pad is $16.99 on Amazon. Yes, Samsung, stole Apple's ideas, boo. The fact stands that Samsung's charger is one of the better options on the market, and visually appealing to boot. It supports fast charging, and uses a multi-colored LED to indicate status. It's also designed so you can use your iPhone while charging is in progress — a definite plus for work environments. 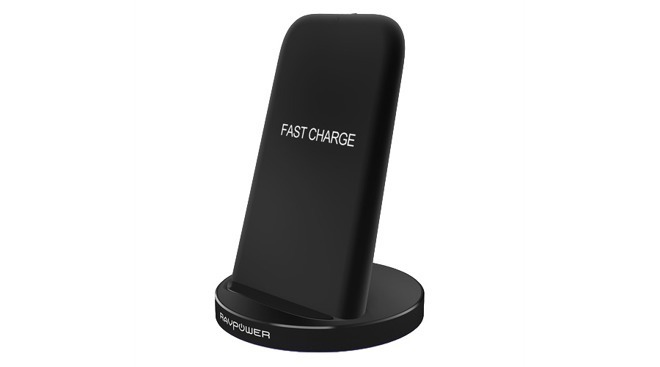 The Fast Charge Wireless Charger Stand is available in black, blue, and white colors at Amazon, beginning at $39.49. 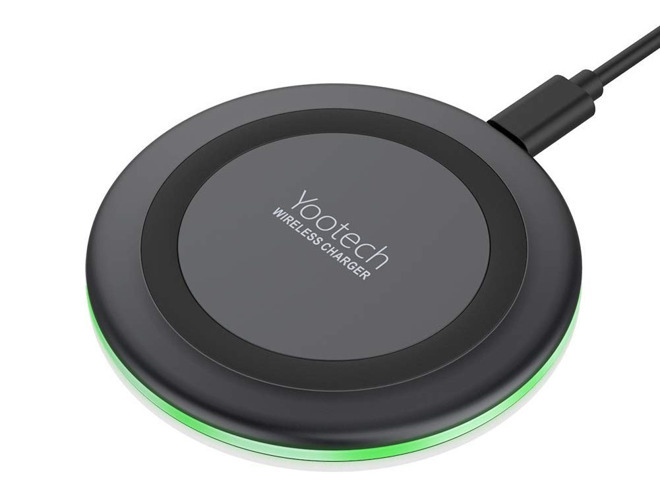 Another budget option, the Yootech nevertheless promises to fast-charge compatible Apple devices, and comes in four trim colors: black, blue, red, and neon green. There's not much else to distinguish it beyond price, though the lights do turn off if you're worried about being kept awake at night. You can find the product at Amazon for $12.99.